Since launching Ownaracehorse in 2005, we look after the syndicate interests of over 2000 individual shareholders every year, each of whom own from as little as 0.20% of a horse, up to 25%. Put simply, we are different because we provide great value, but still provide the same level of involvement you would get with a syndicate costing many hundreds, perhaps thousands of pounds every month. All of our syndicates only have between 40-80 individual shareholders involved, so you are not one of hundreds or even thousands in a racing club - and therefore you will be treated as an individual, rather than just a name on a database. We can keep prices low this because we are internet based, and we have a unique method of sourcing and managing our racehorses. This means that for as little as £90.00 you could own a share in a racehorse with the ability to win races, be totally up to date with the horse's development, setbacks and glories, visit the horse at its stables and watch it run as an owner at the racecourse as well as take your guaranteed share of any prizemoney! 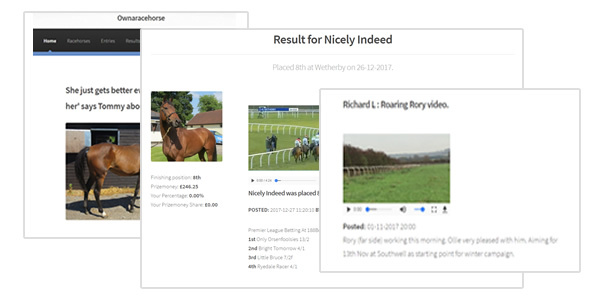 To date we have distributed over £100,000 to shareholders accounts in prizemoney and brought video and news items on a regular basis from over 20 horses a year since we started. With Ownaracehorse you have a manned telephone Helpdesk, and a guaranteed reply to all email within 12 hours. Most Racing Clubs will not provide you with a specific share in a horse, or a guaranteed share of any winnings - but we do. Ownaracehorse has also provided over £50,000 worth of Owners badges for racecourses up and down the country - allowing our shareholders to savour the thrill of ownership for themselves at an affordable rate. Ian bought a share in one of our fillies - First Rhapsody on a Monday morning for only £60 including VAT for the 2005 turf season. First Rhapsody was running at an evening meeting at Newcastle that night - and there were free Owners badges left, so Ian went racing (saving £18.00 on his racecourse entrance). The filly won her race and Ian got a great thrill as his horse was led into the winners enclosure - he even collected the trophy and enjoyed the free racecourse hospitality! We credited Ian's shareholder account for the win - his part of the prizemoney. Since that day First Rhapsody ran a further three times, earning more prizemoney and saving Ian another £30 on his racecourse entrance costs. His shareholder account currently stood at £54 in prizemoney by the end of the 2005 season. Not bad for an outlay of only £60! Obviously we can't guarantee this for every shareholder - Ian was very lucky to choose the right horse! However, whilst this doesn't happen to every shareholder in terms of winnings, every shareholder has the opportunity of free or discounted racecourse badges and visits to their trainer's yard. You can get involved - a third or half of a percent share in most of our horses costs from as little as £130. Or why not buy this experience as a gift for a racing or sports fan you know?